Dr.Abhilash Sandhyala is a distinguished Interventional radiologist, varicose veins specialist in Hyderabad. His mission is to provide personalized, high-quality health care. We have created a practice that we believe in. We are proud and confident about our procedures. We would not move back to practice the same procedures on our own family members! 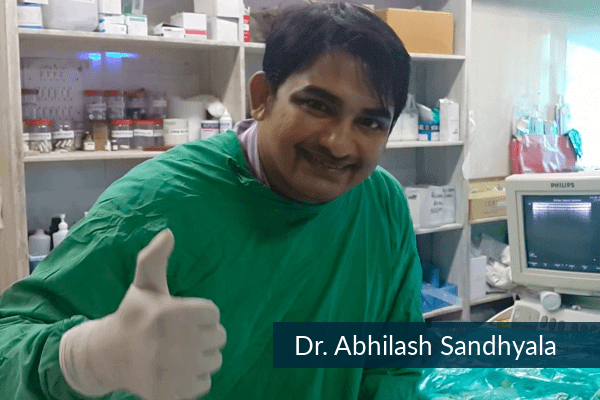 Dr. AbhilashSandhyala is a full-time practicing as Vascular Specialist in hyderabad who believes in working with his patient’s vascular problems to maintain and improve their health. He believes in providing comprehensive healthcare services to his patients in a friendly manner to achieve the best results. Dr. AbhilashSandhyala is certified by renowned NTRUHS (Dr. NTR University of Health Science, Hyderabad, Andhra Pradesh) in Radio diagnosis. He has done an Official fellowship in Vascular and Interventional radiology from the prestigious K.E.M (King Edward Memorial) hospital. At K.E.M, he got extensive hands-on training in treating the most complex vascular problems which many interventional radiologists are inept at handling. Aortic Aneurysm And Aortic Dissection Management with highest success rates.